Why SysTools Email Forensics Software ? While, espionage, intellectual property theft, phishing/bombing of an email account, or heavy spamming in it are usually the cases where email analysis is called for. However, deletion of messages, message storage itself getting corrupted or hard deleted from its storage, acts as one of the major obstacles faced during an investigation. Thus, in order to ensure that a streamlined investigation of emails is conducted. Web based email accounts have become a very common possession amongst users and as a result, also a very common target of cybercrime, at the same time. Connection between both the aspects of webmail services has led to the rise in cybercrime conducted through or via emails, as a result of which data confidentiality and user privacy is being invaded largely. We work towards lowering this ratio by recovering information of web based emails retentively to maintain originality of evidence. Most of the cases involve popular webmail clients like; Gmail, Yahoo, Outlook.com, Hotmail, as they are available for free and do not restrict any facility. Key Benefit: The chief advantage of adopting our application is proven firstly during the intact and quick download of emails from web. And secondly during use of advanced facilities to find out specific set of emails from a bulk of storage. 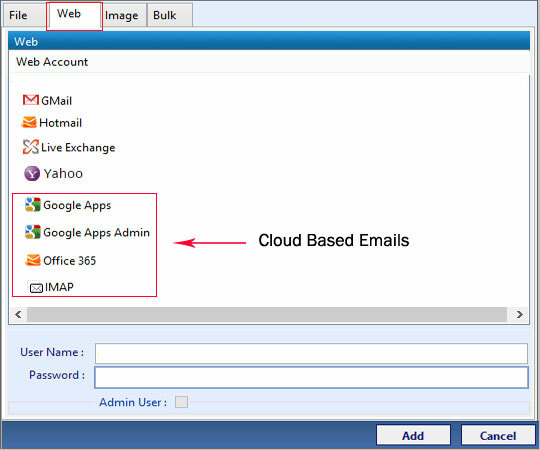 Use of desktop based emails programs are largely observed in organizational environment and for any commercial usage. The clutter free, customizable platform with storage at a local point makes it a secure option to share confidential data or business strategies with. Security can be implemented through many additional layers of protection (encryption/password) but it only takes one loophole to break in. As a result of a local storage, it is easy to tamper with any/all traces of activities conducted on the client end. Key Benefit: Support for recovery of email messages purportedly hard deleted is provided for a large number of local email applications. Microsoft Outlook PST Data File, Offline Data File, Notes Database, Apple Mail, Outlook for Mac storage, Outlook Express, Thunderbird and many more are on the list. The biggest challenge during examination of a cloud based email account is the lack of control over evidentiary contents of a suspect account. We have equally potentiality for the forensics of emails with storage on the cloud. Key Benefit: Multiple accounts coming under a domain can be analyzed for any out of routine activity or communication. Moreover, auto generation of detailed link between users and domains can help quicken the investigation and sight possible suspects. Apart from the expertise of rendering email forensics for a diverse range of storage platforms, environments, and file types we also hold a set of other majorly supportive skills. An email itself stores all the information required for detection and identification of a suspect or perpetrator. An extensive view on the right information set is all that is required to get to a conclusion. Thus, for the same we offer a combination of Advance Search and Multiple Views of different portions in an email besides other powerful facilities. While advance searching lets investigators search through a bulk of messages on the other hand a multiple set of views at the different portions of an email and its headers helps identify and locate suspect. This is a glance at the improvements in email forensics that we endorse through our solution. There is a wide range of likewise powerful peculiarities like; analysis of image based media on the basis of percentage of skin tone detected, regular expression based search, bookmarking of potential evidence, email data classification, detailed reporting of investigation stages, etc., that enhance the entire experience of email forensics. Today, both inculpatory & exculpatory evidences in the form of emails can be found on different platforms, and within varied storage types. Owing to the omnipresence of emails, the arena of email forensics has become largely significant. We deal with the provision of computer forensics email investigation services, forensic email analysis software to help investigators carve out information and minute details that remain undetectable to normal users. Thus, we offer equally versatile and proficient solution to deal with detailed parsing of email messages. With email investigation software , a user is allowed to customize their search filters depending on the scenarios. One can take help of cultivated search facilities for example, In addition, a user can make use of other logical search operators (OR, AND, NOT) also on keyword search for accurate result. Being a forensic email analysis software, it provides users an option to search within emails and attachments. 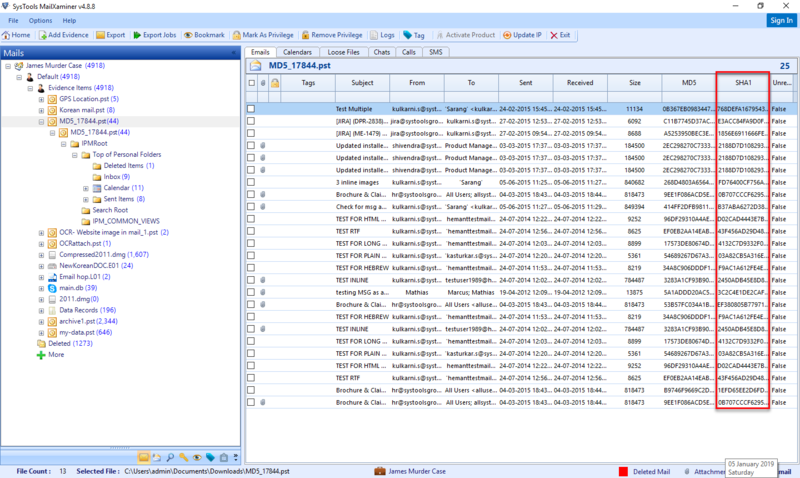 The Case Management is one of the crucial facility offered by this Email Forensics Software. It let investigators to handle one or more cases altogether in a proper way. Management of cases is required in three different ways i.e. 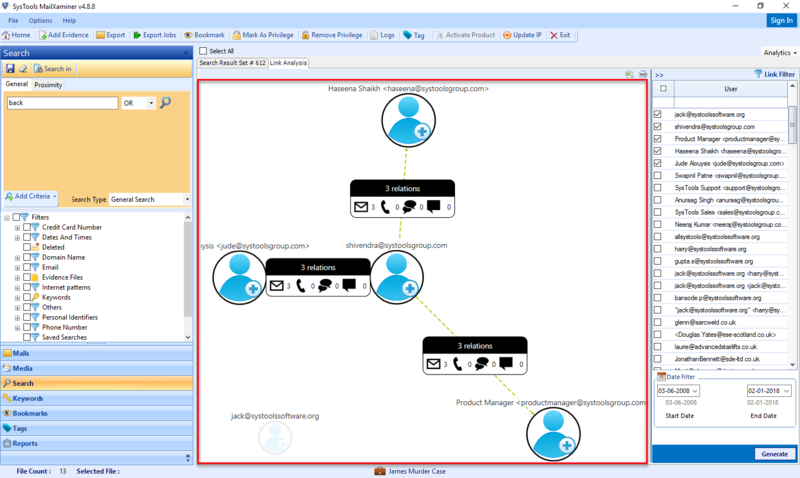 new case creation, already existing cases management, and editing in future. 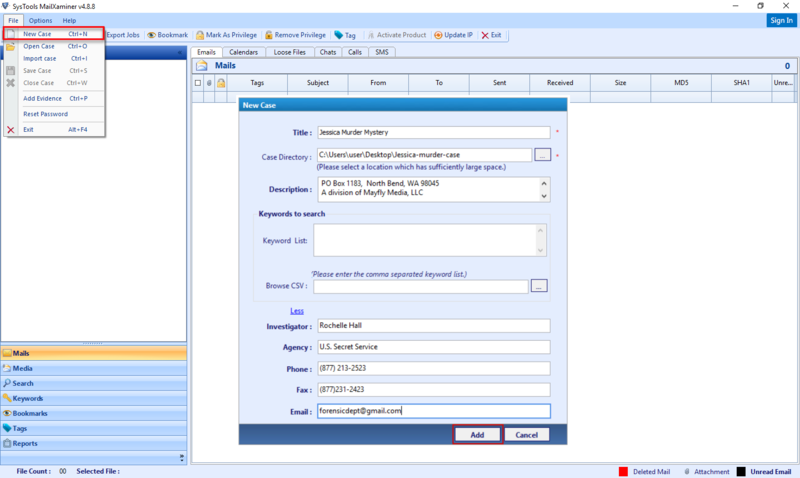 This Case Management facility of this email investigation software provides multiple options for case management. For example, Create case, Open Case, Export case, Save Case, Import case, and Delete case. The Forensic Evidence Collection Tool designed in a way that it is capable to manage native email clients and web-based email services in an efficient manner to perform email investigation in computer forensics . This forensic email collector supports 20+ file formats including both web-based or desktop-based email services. One can analyze and investigates emails stored on Mail Servers also. 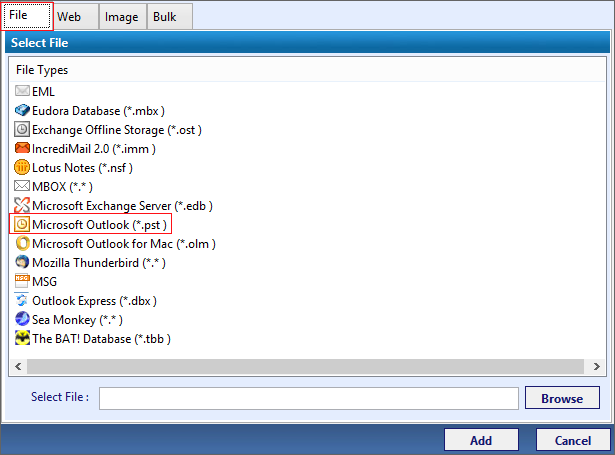 For example, MS Exchange Server, hMail Server, Communigate Server. 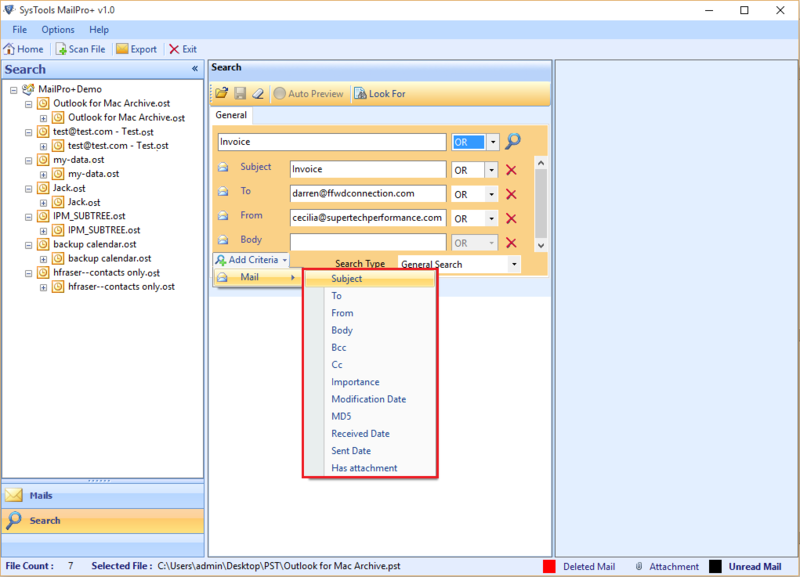 An investigator can search, bookmark, export, preview, and restrict export options on emails. 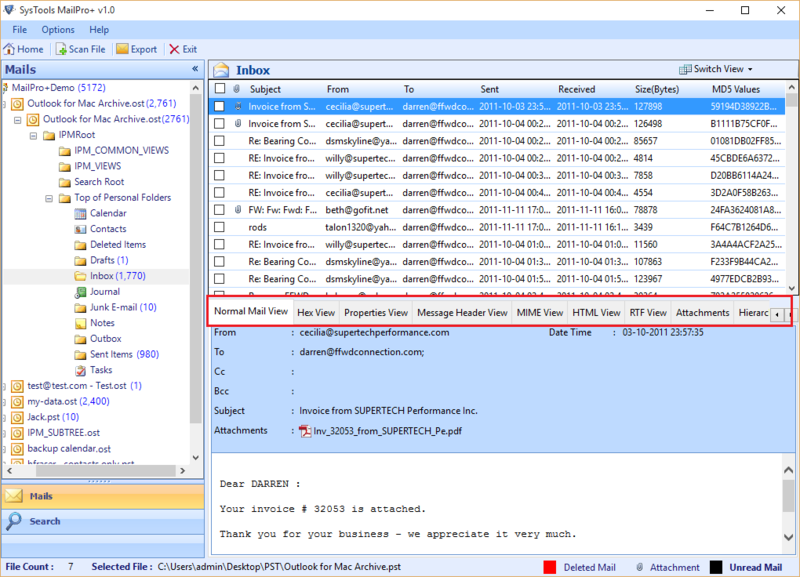 The email view of Email Examiner software is powerful if it is capable to provides preview of scanned artifacts in multiple views i.e., Normal, Message Header, HTML, RTF, Hex, MIME, Property, Email Hop view, Attachment views. All this is supported by the email investigation software. All these details and facilities makes the process of detailed investigation much easier, quick, and convenient for the investigators for forensic email header analysis . Email Forensics Software is designed with advance algorithm that is capable to scan, analyze, and examine EnCase Forensic Image Files of disk also. It includes E01, LEF, Zip Archive File, DD, and DMG. 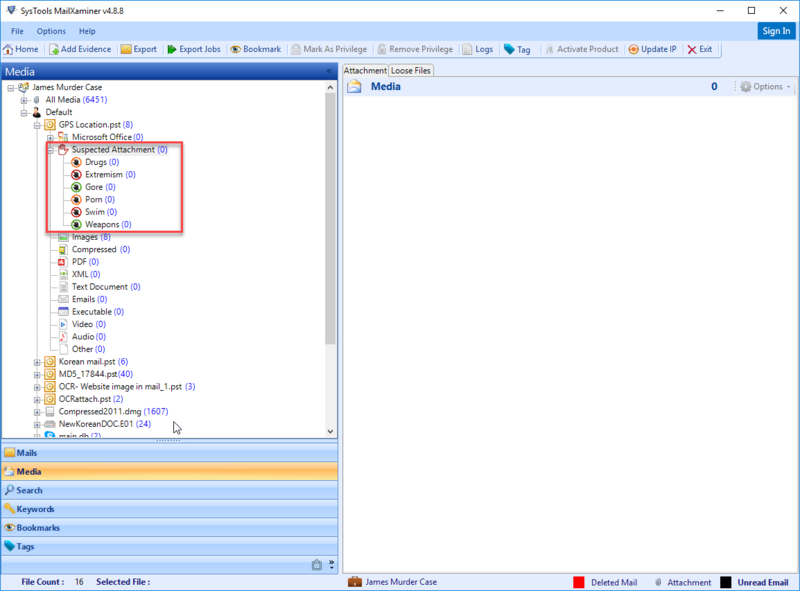 All these are basically an image files that are created when EnCase is used to image or copy a hard drive, USB, or CD. E01 is the extension of primary EnCase Image file. 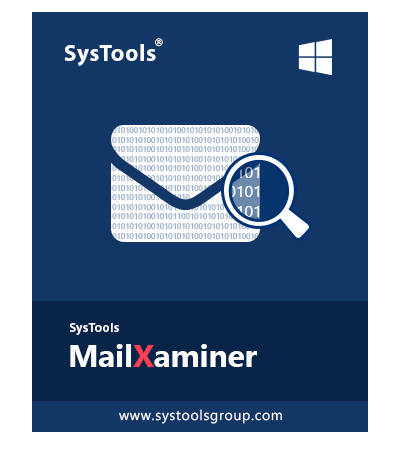 MailXaminer email analysis software has this Link analysis intelligence added in the email forensic investigation software. It let investigators visualize, analyze, and examine the email communication between two or more users. In addition, the tool is capable to keep track of both the direct and indirect conversation between the users. This Email Forensics Software has Time Analysis facility also to analyze the email conversation between the users on specific date, year, and decade. 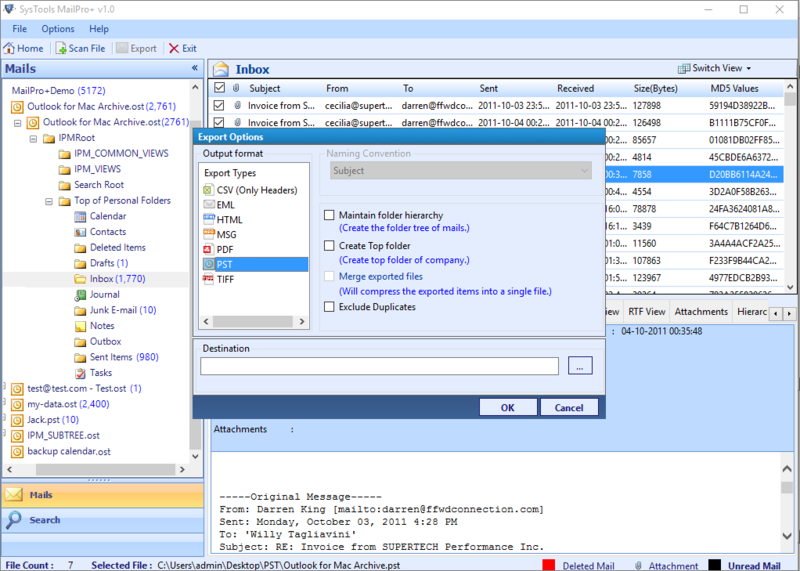 With the help of this forensic email collector, investigators can even view the Chat details, perform call analysis, and view SMS details between different users of Skype application. 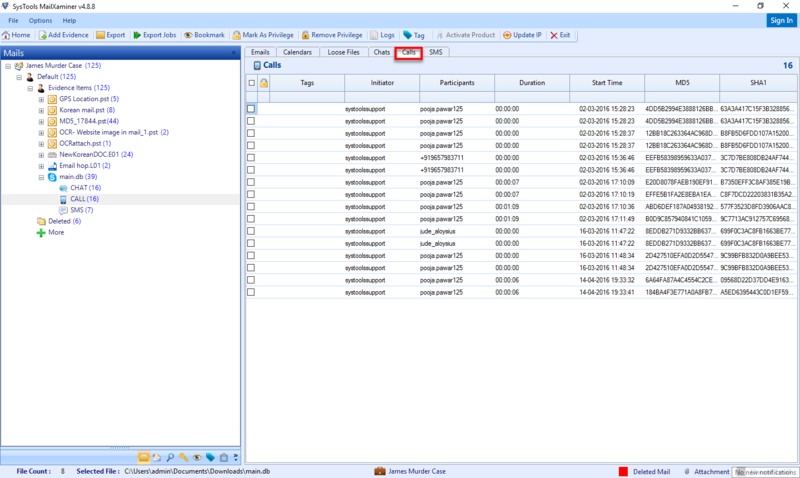 All these SMS, Call, and Chat Details are maintained in the Skype Messenger application database. It provides an option to View, Export and Save chats and SMS in the documented format also. This Email Examiner software provides a Super Grid Data filter that let users perform more accurate and improved search & Email Forensic analysis on the data. The Grid Count feature let them view multiple entries at once. This will let users search for particular keyword without going to search options actually. 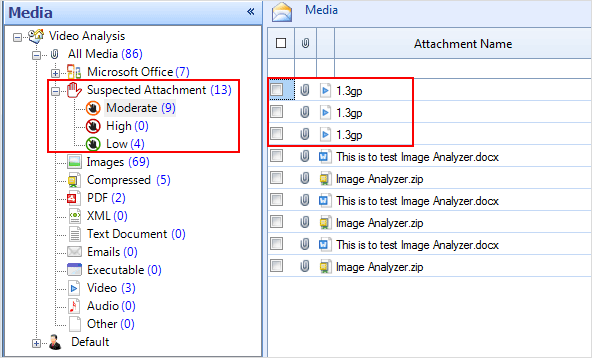 As the file is scanned completely, one is allowed to perform grid search by type keyword in the respective grid itself. The reporting feature of Email Forensics Software has been made in smarter way to view and export after email forensics investigation . One perform forensic email analysis and export the reports of cases, keywords, bookmarks, tags, etc., in several output formats i.e., HTML, PDF & CSV. In addition, a user can export senders, recipients, domain-wise, domain-wise senders reports also without any limitation. However, all these details are very important as it need to be presented in the law enforcement agency. To know the geographical location of particular image available in an email. After that, export the exact location in KML format to present as an evidence. It maintain log files of all activities during email forensics including details like scanning, search, report, tag, bookmark, not indexed. Allows to examine & analyze documents in all formats stored. After scanning file, the Display panel will preview of scanned file and right panel will display the all artifacts available in it. SHA-1 is a hash function algorithm developed by NSA to check the integrity of data. Thus, in this email investigation software SHA-1 implementation will help the agents in identifying such emails.. 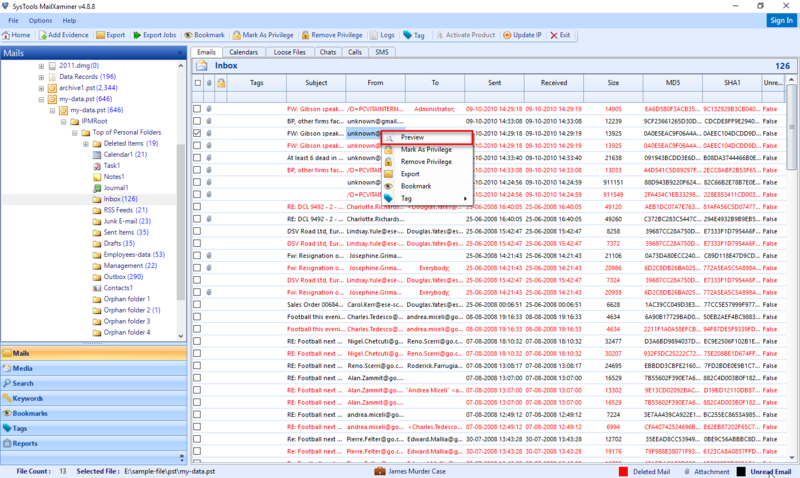 Allows to tag or bookmark any forensics evidence from mails, attachments, or search results. Acquisition support for network offers assistance to investigators for scanning files from a "Network or Domain". Can I search for some particular type of files from a large size hard drive and analyze it for evidence using Email Examiner software? 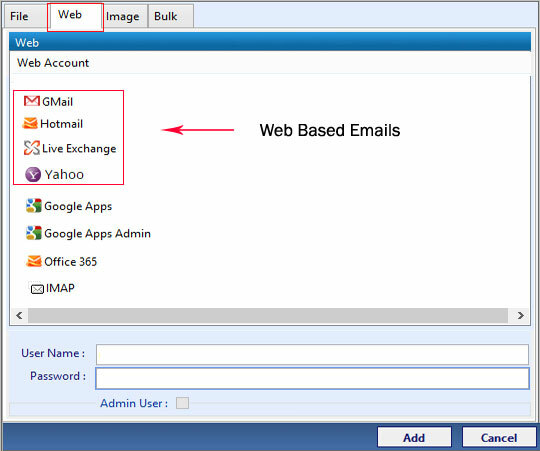 Yes, this Email Forensics Software supports Grid Data Filter option that let users perform any search directly in grid. For example, a user need to type particular file extension in File Name grid, it displays the matched result for the same. Is there any way available to check the integrity of emails during Email Forensic analysis ? Yes, a user needs to check the SHA-1 option under Hash Settings to check the integrity of data. What all type of image files can be examined with the help of Email Forensic Evidence Collection tool? 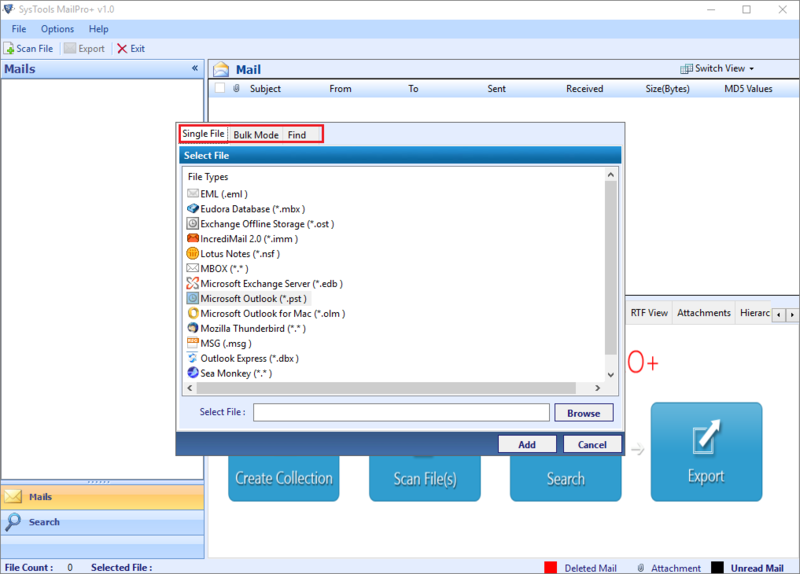 In this email investigation software , a user is allowed to add, analyze, and examine E01, DD, DMG, LEF, and Zip Archive File type EnCase image file. Can I search for keywords in Japanese language also for quick results for evidence collection? Yes, within forensic email analysis software you are allowed to search for an email in all files via specific keyword. In addition, a user is allowed to search for keyword in multiple other languages also, including Japanese. Does the software provide any facility to check the chat details of messenger also? Yes, the MailXaminer is capable to view, search, and export the chat carried out between the users. Locate desired evidence files automatically on any particular choice of drive. This Email Forensics Software will let users gather all suspected data files as an evidence in one collection. This will make management of evidences even more easy for the email forensics investigation in cyber forensics . After this, a user can scan, perform a search, and analyze all of them at once. Storing all of them for future use is also really helpful. Email investigation software, an email header analyzer is a one-stop solution to deal with all major types of email application’s data files. This forensic email collector works on around 20+ file formats, which are supported by 80+ email clients. 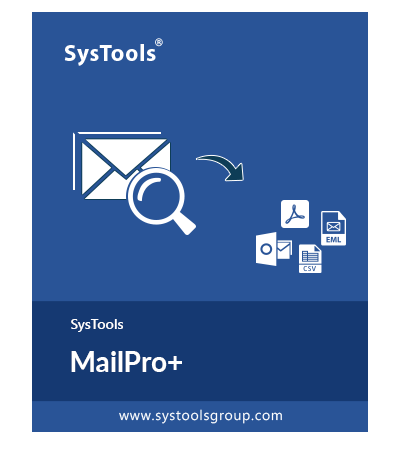 Some of the common email types supported by MailPro+ tool are EDB, OLM, PST, NSF, OST, DBX, EML, MSG, and much more. A user can easily export all of them into any other supporting format in either single or bulk mode. Sometimes to hide data deep down from others, users create nested sub-folders. At this point, opening each and every subfolder is a really time taking task. To avoid such kind of hindrance, a user can right-click on the root folder and choose Show recursive listing of mails. A preview of all emails in both folder and its nested folder will be listed. Depending on the choice of a user, either selective emails or emails in bulk are exported successfully to any other file format. It includes multiple export types like PST, EML, PDF, MSG, TIFF, CSV and HTML. This facility of the email header analyzer let users move their data from one platform to another at one place. During the suspected evidence export process, email investigation software provides users multiple export settings to customize it & perform forensic email analysis accordingly. To manage the analysis of emails in a proper way, investigator’s can use Naming conventions like subject, subject+DD-MM-YY, etc. 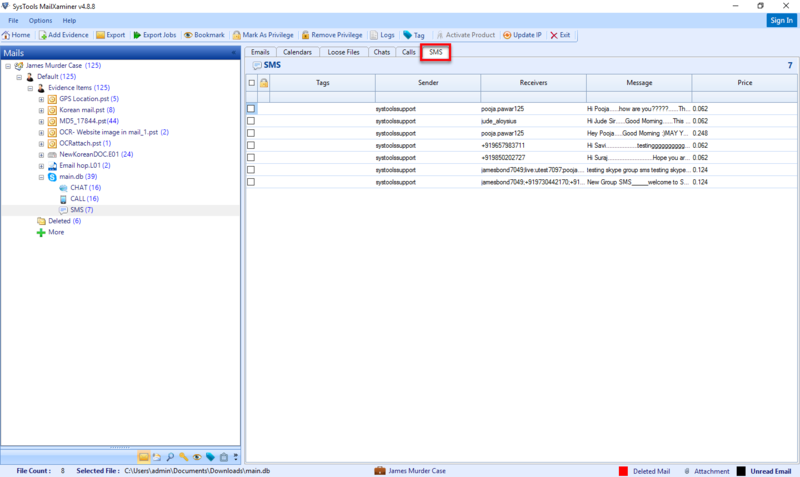 In addition, it provides an option to keep folder hierarchy intact after conversion. 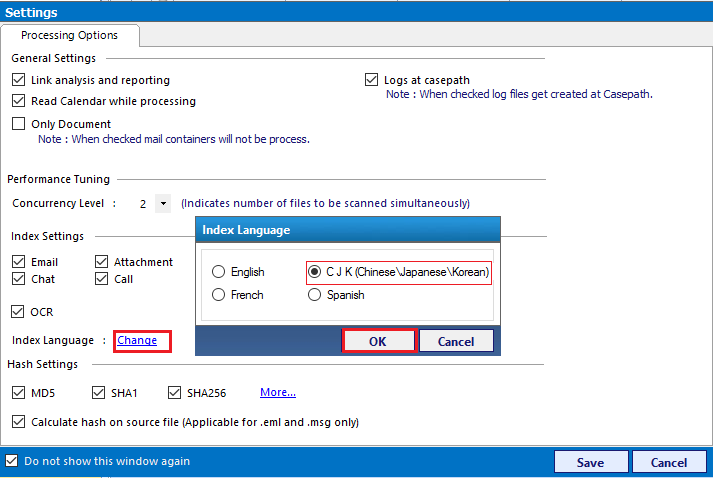 In the case of large number of files, there is an option to merge them at the time of export process. 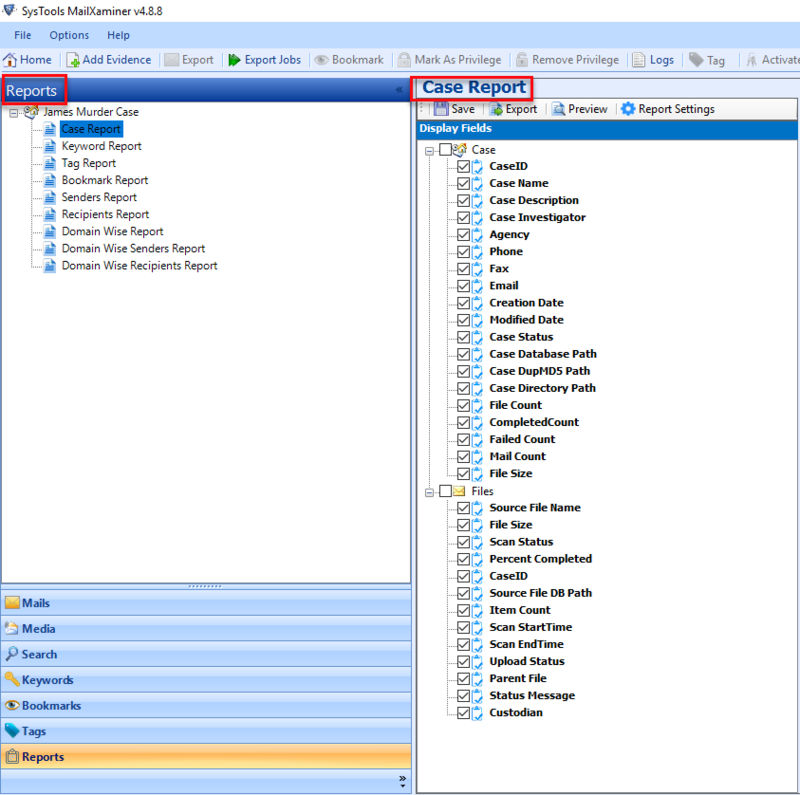 The Email Forensics Software generates a complete report of the export process in the CSV file. It includes details like success count, fail count, and path with exported file path, export status, subject, source file path. All such type of information is really important for an email forensic’s investigator. 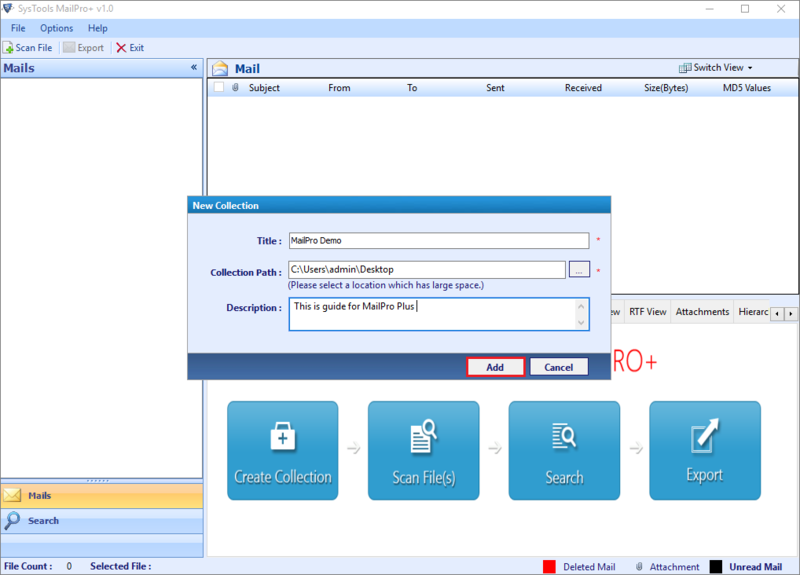 Trial version of Email Forensics tools (MailPro+) export 50 items and allow adding 2 files of each type only. Trial version of tool scans the file size up to 2GB and allow adding 10 files in a collection. Can I view the MD5 value of some of my emails using this Email Forensic Tool? Yes, with Forensic email analysis software you are allowed to view the MD5 value of all your scanned emails with the help of this application. The Email Examiner software application list all emails along with its attributes such as subject, MD5 value from, received, to, sent, etc. Is it necessary to install or configure Lotus Notes application on the local machine to analyze NSF file emails? No, the Email Forensics Tool does not require any extra installation on the local machine to analyze any file emails. Does the Email Forensics Software provide view of contacts and calendars also stored in my PST file? 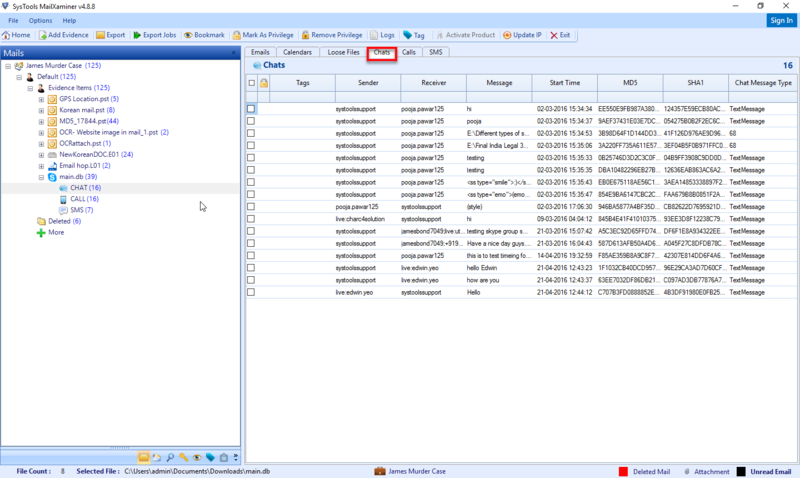 No, Email Examiner software does not let users view contacts and calendars stored in PST data file. It is because the application is only Email Forensic analysis based. It is used to perform email forensics investigation quickly. Is there any restriction on number of evidence collections that one can create using MailPro+? No, there is no such limitation on number of collections a user can create by the email investigation tool. One can create any number of collections and add any number of files of any desired type. 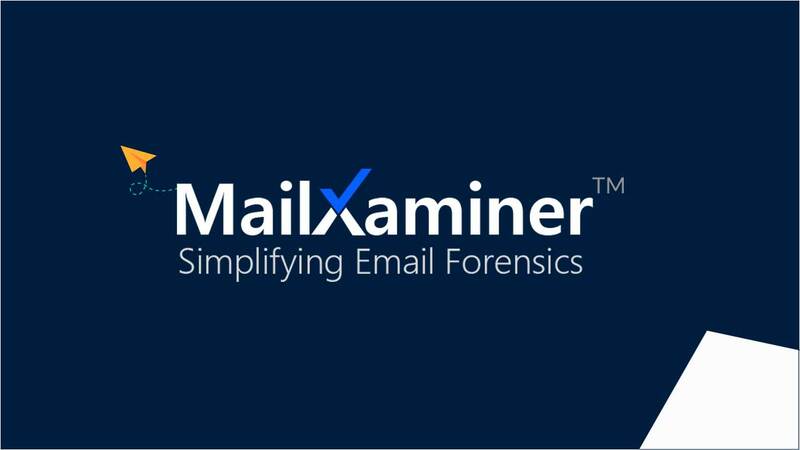 This MailXaminer forensic email collector is an amazing application that I used to solve my multiple email forensics investigation related queries quickly. The Email Forensics Software is designed is so smartly that it let me perform searches in a very flexible way. Highly recommendable software for email forensic investigators. It is one of the best email forensic software to manage multiple cases & perform forensic email analysis at one place. The best part about the forensic email analysis software is that it let me analyze evidence from image file also. In addition, the results generated by software is easily acceptable as an evidence in court also. Thanks SysTools for such great development. Keep it up guys. Being a digital forensic’s investigator, it my day to day job to analyze emails in depth. Therefore, I was looking for a solution to that let me deal with several email file type at one place. After using this email investigation software, I can easily say that it is a great forensic email collector application that saves my lots of time. Great work developers!!!. Examining a single in a different style sometimes takes lots of time. Thanks to Email Forensics Software for being a savior for me. The huge range of views is really amazing and now I can examine each email in a more precise and reliable manner.